Hi! 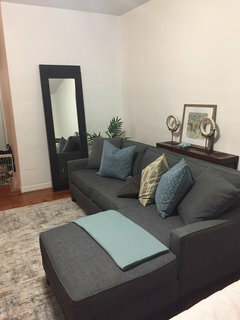 What would make this room special? I'm talking bed, bedding, drapes, and wall art. It's a rental so no paint or wallpaper, sadly. The plant is a hidden litter box for kitty. It has to stay. Thanks and look forward to your brilliance minds. I love plants. They don't live long in my home. Lol. 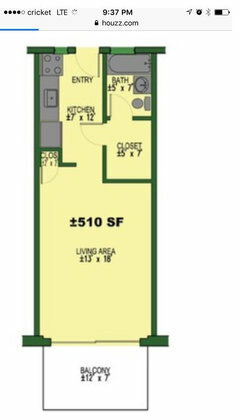 Can you draw up a rough sketch of the floor plan and a few more photos? 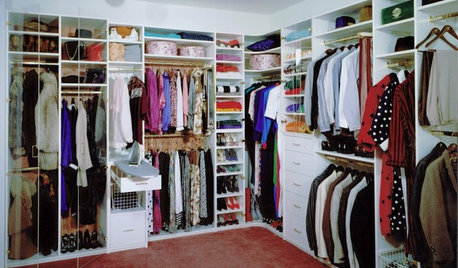 What are you needing more storage, privacy etc? Not looking for privacy. I want a full open layout. Wow ! Amazing view out back ! 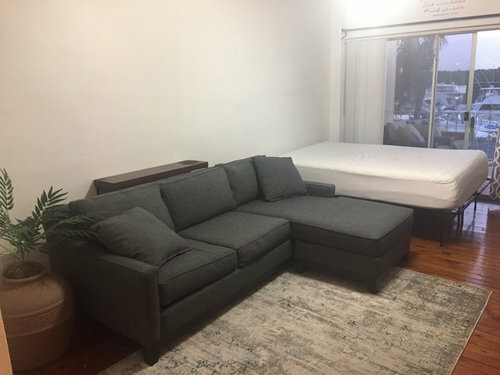 Would you consider swapping the bed with the sectional ? Can the bed tuck into the corner against the walk-in closet wall ? If you want a quiet neutral space , stick with the greys in the rug and sectional and consider a soft grey quilt set . If you are looking for a brighter space , update your carpet under the sectional and get a bed set to bring more color to the room . can you move the cat plant to the other end of the sectional by the slider? Have you considered temporary wallpaper for a big impact ? I used to have the bed like that up until a week ago. I get stir crazy in this tiny space so I move it back and forth from time to time. I love grays and the idea of keeping it like that. 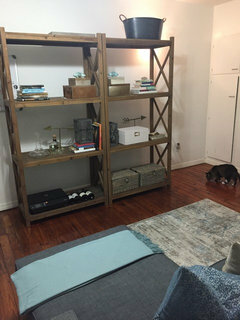 Because the rug was bought a few months ago, not looking to change it just yet. Take the shelves and put them behind the sofa, put the (too small) table by where the shelves are, along with the pot with leaves in it. scoot the sofa left a bit more and add nesting tables to one side. 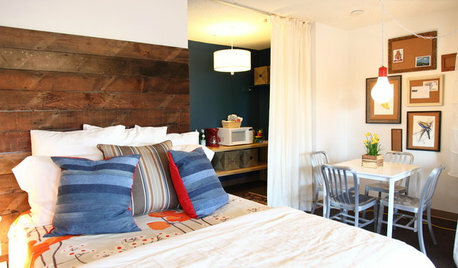 I love the idea of the hotel look by adding a great headboard and lamps . 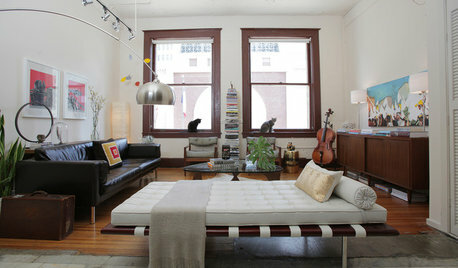 The layout suggested by others to put the bed in the corner and the sofa by the glass doors would be the best. However, the second suggestion moving the bookcases will be fine, but agree you need a nice headboard. 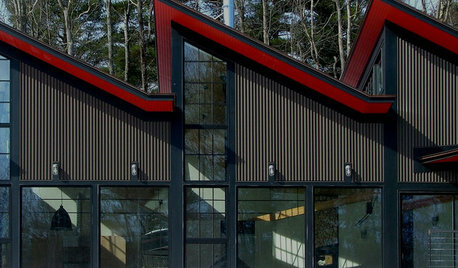 Looking like a boutique hotel is fine as long as you do not have company often. 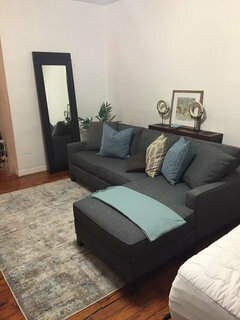 If you love the bed by the sliders, can you put the sofa so that the back is to the bed? Now the bed is hidden from the living area. 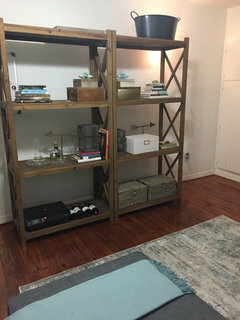 Shelves and TV can go on the closet wall. It wouldn't be my first choice because you generally want the view, but since you are liking the bed by the window, it would be a new set up and it would be cozy for the bed, and clean for the living area. well because the room is unfinished, you have no headboard and haven't let us know if you are going to try moving things around. you need a headboard before art. do you plan on a TV? The sofa and bed are staying where they are at. I'd like a bed, not a headboard. Opposite the sofa are two etageres in the previous pic. Those will be separated by a tv. Across the bed will be the small desk. Right now, there's a massive desk and the TV is on it. That of, course, will change. you have a bed so that is a bid confusing? I would not put the tv between to bulky shelves at your entry. have you given any thought to moving the book shelves or any ideas anyone has? It's a studio so that's why the bed is there. One small rectangle room. The shelves are staying on that wall. you keep saying you want a BED not a HEADBOARD, WHAT DOES THAT MEAN? seems like you have it figured out! I'm struggling on choosing a complete bed frame. Right now the bed is on a metal platform. I want to change it for a bed frame. Headboard, rails, maybe footboard, maybe not. In your original thread, I think someone posted a bunch of bed options. Did you see those pictures/comments? I did. 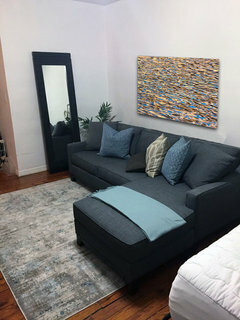 Do you think a wood frame or upholstered is better? 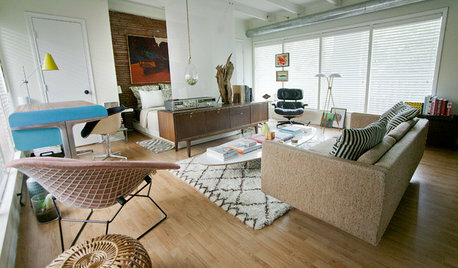 I think in a smaller space, softer lines are better so I'd say upholstery. 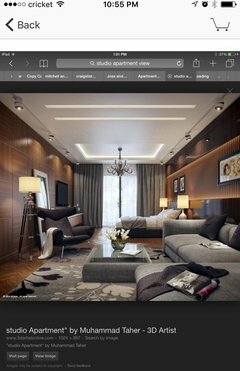 You'll just want to tie all the elements that will be in close proximity - sofa, pillows, headboard, bedding, etc You should also make some idea books, the pros use them often to make recommendations. Yes! That's what I want. To tie everything together. Just don't know how to do that. Then you should make some idea books and see what that garners. I also think the conversation was moving on the other thread as several very respected pros and Houzzers were in on your dilemma. You may want to revive that post. 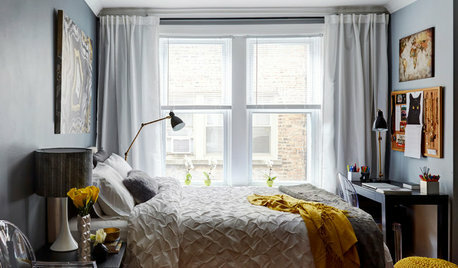 Between some of their recommendations and a an idea book of things you love, you'll find where the room is meant to go. This can be printed as a 60"x40" canvas or 30"x20" unframed print or wall display. It's a sunrise reflected on water ripples, which may be a nice complement to your waterfront view. It's also adds a pop of color for accessories. 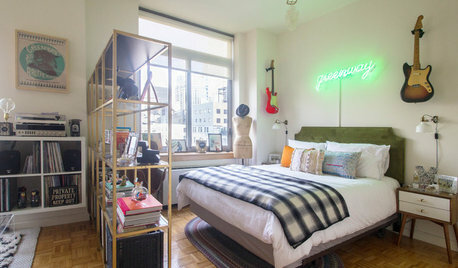 SMALL HOMESHouzz Call: Show Us Your Cool Studio Apartment! 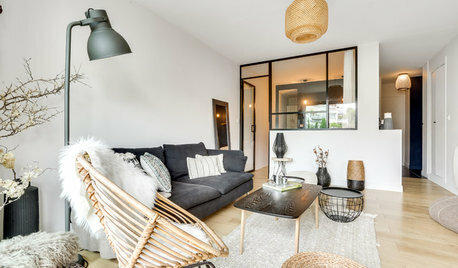 Help me decorate my studio loft apartment!